Today another week of Blogging Marathon #15 is getting started. I have selected Thali for this week. For the first day I will be posting about the thali I prepared for Tamil New Year. My younger brother visited me on that day with his family and I prepared this thali for lunch. We had a filling lunch that day. It is actually a fusion thali which has dishes from many parts of India. 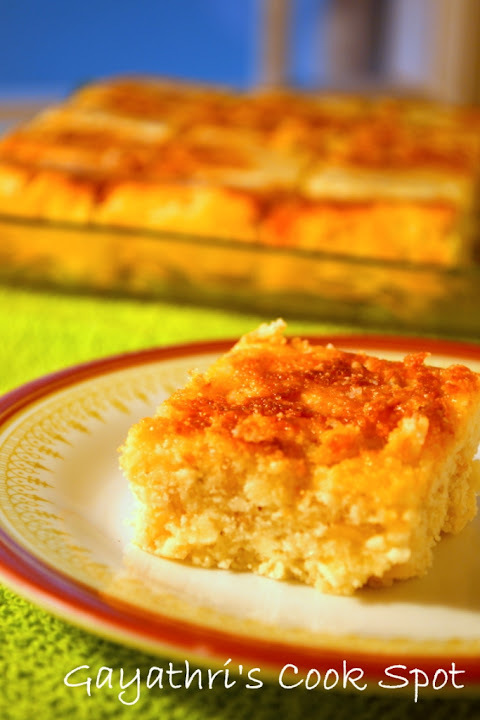 The sweet chenna poda is from Orissa and the Jodhpuri Mirch Paneer from Rajasthan. The other dishes are from South India but I couldn’t tell you any particular region for the dishes. These are prepared most houses during special lunches. A Rajasthani dish which includes green chillies and fried Paneer. 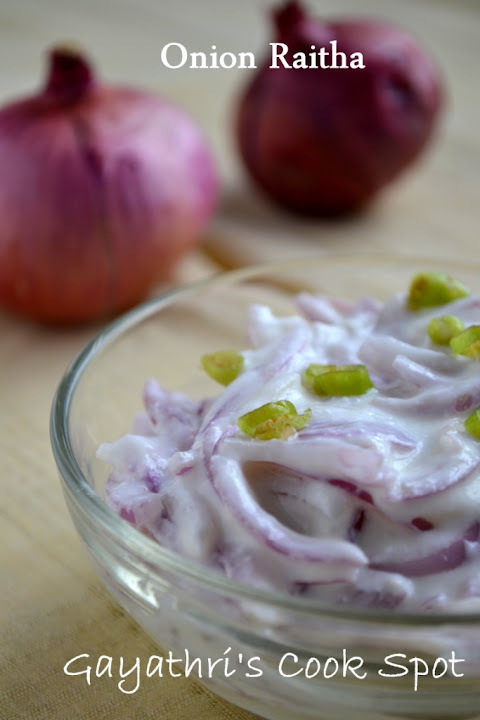 A simple yet delicious raitha with onions and fresh curds. 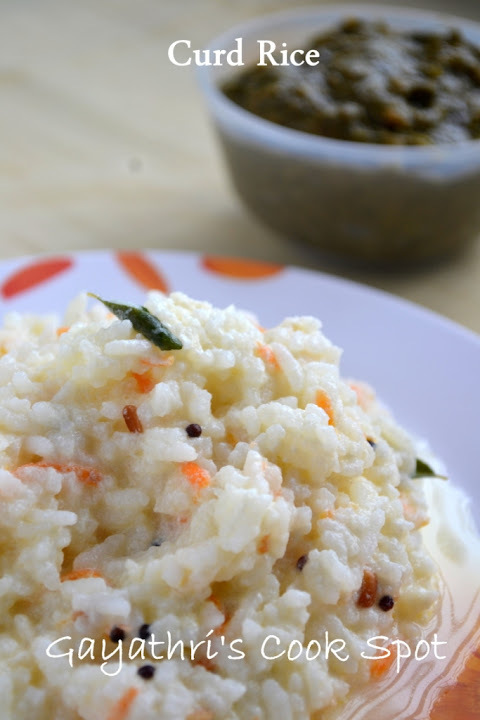 Rice mixed with curd and milk to create this perfect cooling rice. 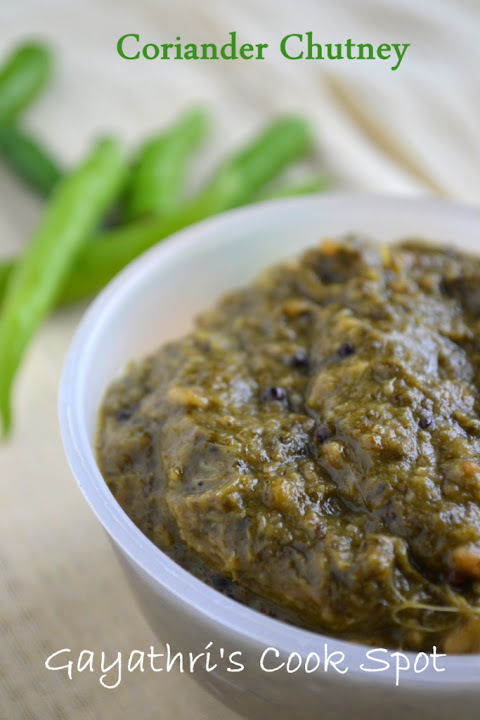 Coriander leaves sauteed and ground with tamarind and green chilies. 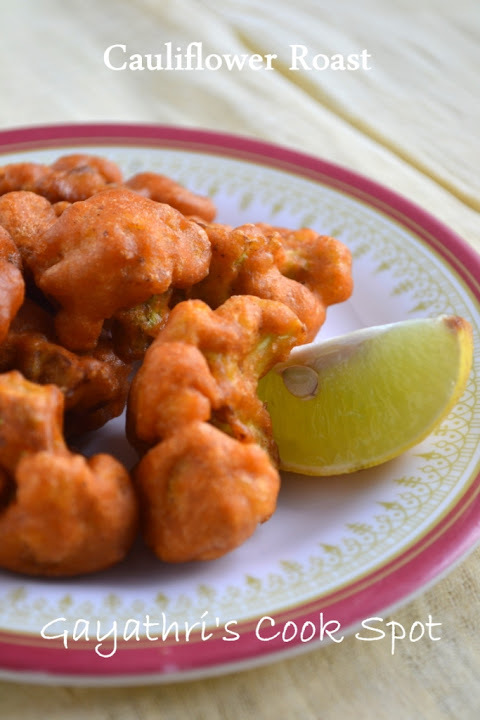 Today I will share with you the recipe for Jodhpuri Mirch Paneer. The preparation is very easy. The chilly makes the paneer hot. The whole chillies are sauteed in oil and so it tastes great along with paneer. 1. Grind ginger, garlic and red chillies to a fine paste. 2. In a non stick pan, take 2 tbs oil and add cubed paneer. 3. Saute until golden and crispy. Transfer to a bowl of water. 4. Heat remaining oil in the same pan. 6. Add slit green chillies and saute until the onions are transparent. 7. Add the paste, tomatoes and salt. 8. Cook until oil separates. 9. Remove the paneer pieces from water and add it along with garam masala to the pan. Give a nice stir and transfer to a serving bowl. 10. 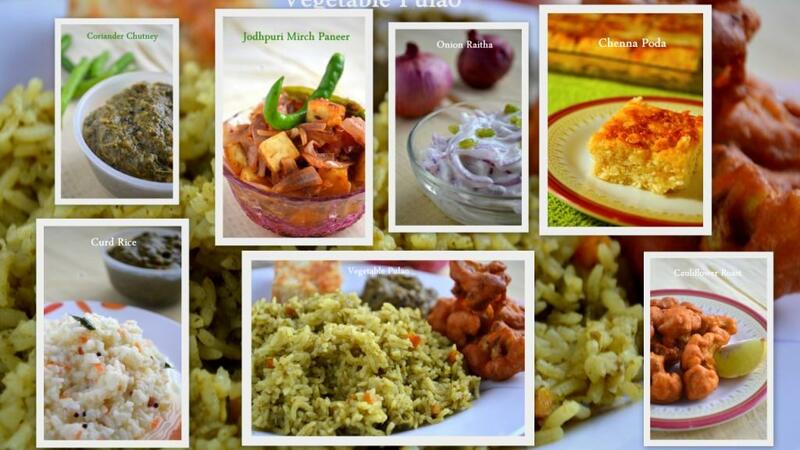 Serve along with pulao or rotis. I will be updating this post when I post the other recipes. Beautiful Thali. I loved the collage showing entire thing in individual pictures over the entire thali background. Beautiful work. Tempting thali. Love to have the plate. Omg, mindblowing spread, am hungery even after having my lunch..excellent dishes. Tempting and delicious thali,drooling over the pictures..looks yummy. Lovely platter. drool worthy pictures too. Delicious thali. Yummy dishes and beautiful clicks. Wow Perfect click and tempting dishes. 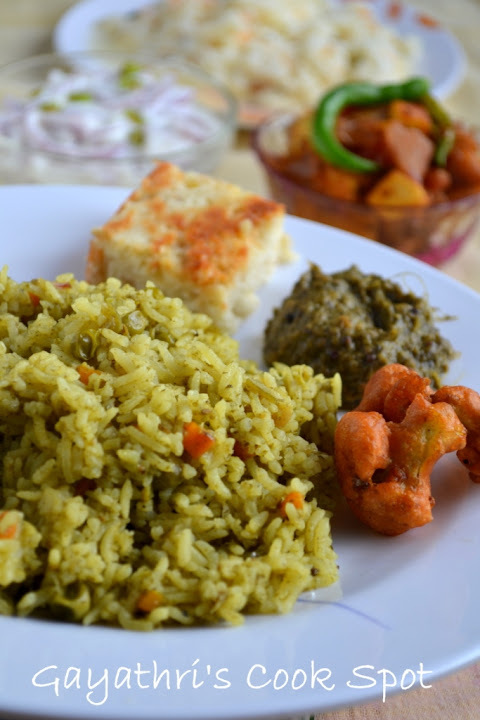 Such a beautiful fusion thaali…my eyes are totally on the cauliflower roast …fantastic. Good one Gayathri. Everything looks so awesome! Nice clicks too, as always. loved the fusion thali ! what a comprehensive thali – absolutely superb!!! 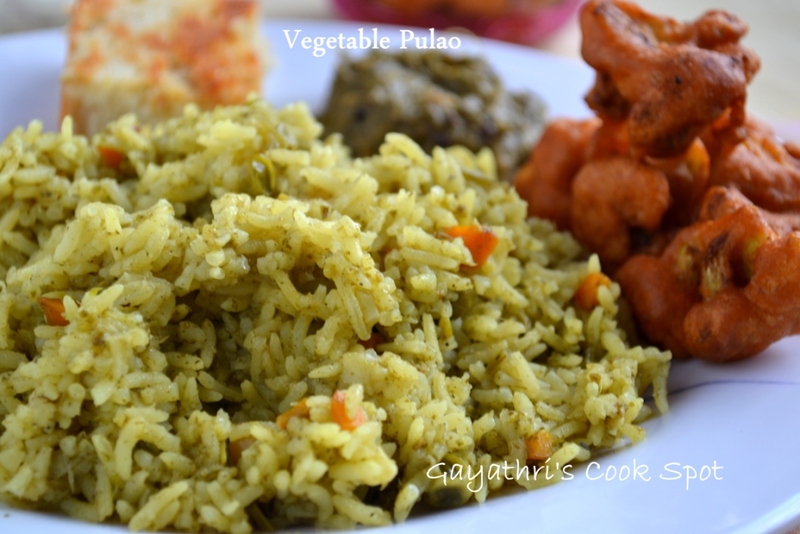 Well done gayathri, simply yummy platter…Luv all dishes!! Awesome post and thali..you are rocking Gayathri! thanks for the lovely entry! great clicks & a wonderful fusion spread, Gayatri !! look fwd to your Thali series this entire week ! Beautiful thali and loved the clicks. know what?..this thaali event is driving me crazy..lovely fusion…loved the collage and clicks! Awesome collage and scrumptious spread! Wonderful spread and the paneer looks delicious.. Awesome thali.You have not mentioned recipe for Coriander chutney.Can u please post the recipe. Hi.Its an Awesome Thali,very beautifully presented.Can you post recipe for Coriander chutney. Though I would never have the courage to eat that spicy curry, the menu is lovely.